Chris Kehler (L) and Benjamin Vanderpool (R) are pictured. Longtime local attorney Christopher D. Kehler has been appointed by Indiana Gov. Eric Holcomb as judge to the new Kosciusko County Superior Court IV. 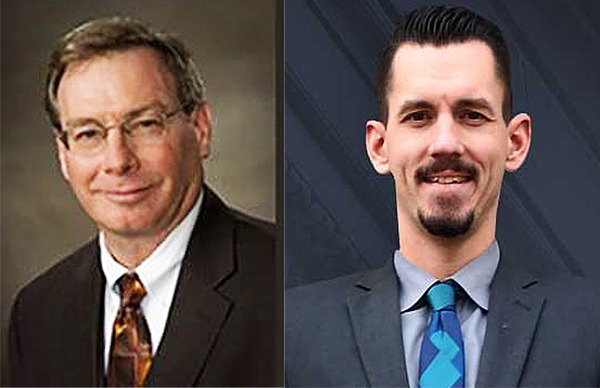 A second local attorney – Benjamin D. Vanderpool – was appointed to the Wabash County Superior Court to succeed Judge Amy Conner Cornell, who died earlier this year. Official press releases announcing the judicial appointments were issued Thursday. “I’m very excited and honored to be appointed by Gov. Holcomb as judge to Kosciusko County Superior Court IV. I look forward to this new stage of my career,” Kehler said in a telephone interview Thursday. He sent his application to Holcomb in January. There were four candidates: Robert Bishop, Lindsey Grossnickle, Chad Miner and Kehler, with the governor making the final selection. “I’m very pleased he selected me. I look forward to doing a good job,” Kehler said. His duties as judge will begin July 1. His position will be up for election with the other Superior Court judges in May 2020. “My goal would be to run,” Kehler said. The court is going to be largely focused on cases involving families and civil law. Kehler graduated high school in 1980, from Franklin College in 1984 and from Valparaiso University School of Law in 1987. He was sworn in as an attorney in July 1987 and has been practicing law since. A news release from Holcomb’s office indicates Kehler also has served as an adjunct professor at Ivy Tech Community College. “This July will be my 32nd year,” Kehler said. During the application process, Kehler said he felt one of his strong points was his experience. “I have been working in the area a long time. I’ve been an attorney and a mediator,” he said. He also said he thought his interview went really well. Kehler thanked his many supporters. “I had a number of people write letters of recommendation. I thanked them personally today for their assistance,”?he said, noting people have congratulated him and told him they had hoped he’d be the new judge. “I’ve been supported by a lot of people. It’s been very gratifying,” he said. Vanderpool has been in private practice in Wabash and Warsaw since graduating law school, according to the news release. He earned his Bachelor of Science from Purdue University and his law degree from Thomas M. Cooley Law School. He graduated from Northfield High School. In a telephone interview Thursday, Vanderpool said there was an application process after Cornell died. Vanderpool submitted a long application, writing samples and other information. Holcomb’s team reviewed the applications and Vanderpool, 34, said he had an interview last week. He just learned Thursday of the appointment. “I’ll fill the term out as judge, take over the day-to-day, handle cases,” he said. The term ends in 2020, but Vanderpool said he will run for election of the judge’s position then. He would like to serve as judge there for the long term, he said. Ever since law school, he said, his goal was to be a judge. He has filled in as judge in three of the four Kosciusko County courts and two in Wabash County. “What they handle down here in Superior Court is my day-to-day practice – small claims, family law,”?he said. His family is from Wabash and lives there still. After law school, Vanderpool said he’s been working with his dad – Dan Vanderpool – and his brother joined them two years ago. They have an office on East Center Street in Warsaw. “Dad was the Circuit Court judge for 18 years in Wabash before retiring. He’s very excited for me,” Vanderpool said. “I’m excited. I’m really excited about the opportunity and getting started. They’ve got a lot of things going on down there,” he said, that he’s eager to be a part of.